"Our elders should be treated with dignity." 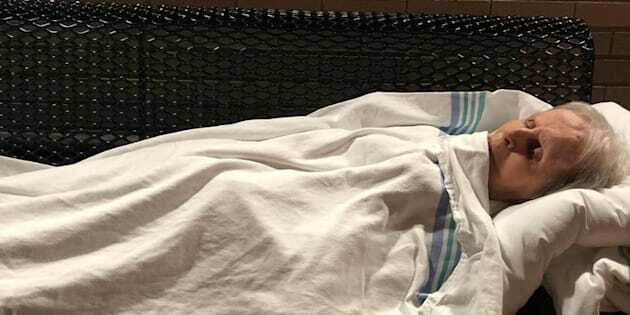 When Pascale Létourneau arrived at an emergency room northwest of Montreal with her 79-year-old mother, she never imagined the senior would end up lying on a metal bench for hours. Jacqueline Boivin had been experiencing stomach pain for two days. When she arrived at the hospital in Saint-Jérôme, she was assessed as a Level 4 in triage, considered to be one of the least urgent cases in the ER. "My mother, she's not a woman who complains. She's very discreet and patient, in the sense that she's been through a lot," Létourneau told HuffPost Québec in a phone interview Thursday. "So, it was difficult for the people in triage to consider her a priority." As the evening wore on, Létourneau said she tried to ask for a stretcher so her mother could lay down, but they were all occupied. She ended up making a "bed" for her mother on a metal bench outside the ER waiting room. The hospital provided blankets and another patient graciously gave her a pillow, she said. "Our elders should be treated with dignity," said Létourneau. "When you're in an acceptable and comfortable position, you can sleep. Trying to sleep sitting down, it's complicated, let me tell you." Seeing her mother in these conditions broke her heart, she added. Boivin finally saw a doctor at around 4 a.m. on Wednesday. She is still in the hospital, where she's being treated for a gallbladder infection. The Laurentian Integrated Health and Social Services Centre that runs the hospital said normal procedure was followed in Boivin's case. "We distribute stretchers on a priority basis. Unfortunately that day, there were people in much more urgent situations," said spokeswoman Myriam Sabourin. Age is considered as a factor, she said, when it affects the patient's health condition, but in Boivin's case, it wasn't serious enough for her to be given a stretcher. "All the emergency rooms in Quebec use the same triage criteria and allocate their resources the same way we do," she said. The person did have the waiting room at her disposal, so it was her daughter's decision to bring her outside, and she is responsible for that choice."